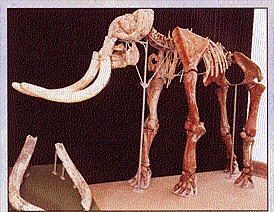 If you are in Emilia Romagna and are interested in ancient history you ought to visit Savignano sul Panaro: you will find the wonderfully conserved skeleton of a prehistorical elephant , the "mammuthus meridionalis". It was found by the Panaro River banks in the mid '70s and is now exhibited at the local Civic Center (Centro Civico). Several objects found nearby Savignano show that the area was inhabited in Prehistory, and in Etruscan and Roman ages. Years ago a very interesting archeological find was casually discovered in a fluvial terrace by Savignano : it was the famous "Venus of Savignano", a little statue in serpentine, which belonged to the superior Paleolithic period (about 30.000 years ago). It represents a woman, symbol of fertility. The original of the Venus is at Pigorini Museum in Rome, but you can admire a copy of it at Savignano Civic Center. Other Prehistorical finds of the area are stone splinters, scrapers, arrows, daggers, hatchets, pieces of pottery, remains of huts.